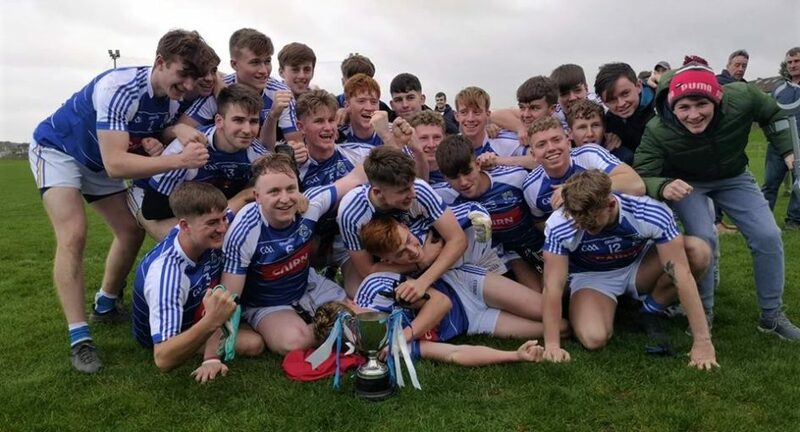 Shaun Cranley led the way as Éire Óg produced a near-flawless second-half performance to win the Under-20 ‘B’ Championship over Rathnew on Sunday afternoon. The Greystones side were ahead at the interval following a cagey and sloppy first-half. Seán Coffey’s goal gave Rathnew the lead going into the final five minutes of the opening period, only for late frees from the clinical Shaun Cranley to turn the game around. The second-half saw Éire Óg put in a dominant and ruthless display to run riot on the Village men, as Cranley notched six frees to take the game, and the Paudge Dooley memorial cup, to Greystones despite the best efforts of an overwhelmed and outmatched Rathnew side. Despite the final scoreline, it looked for the majority of the first-half of this championship final like it would take something special to separate the two sides. It took five minutes for the first score, with Fintan O’Shea connecting with Cian O’Flaherty to split the posts and give Éire Óg the lead. O’Shea doubled that advantage moments later as the Greystones side started to assume control over proceedings. Despite that early dominance, Éire Óg were unable to expand on their lead. registering two misses before Ciarán Coffey got Rathnew’s first score of the day from a free in the 12th-minute. Both sides exchanged wides before Rathnew drew themselves level through a Dylan Smyth free. Conal Deeney restored Éire Óg’s lead after Niall Kearney had sloppily given the ball away, before Seán Coffey turned the game on its ahead with six minutes of the first-half remaining. Ciarán Coffey claimed the mark in midfield, before moving it onto JT Moorehouse. Moorehouse then dropped a high and hopeful ball into the Éire Óg square, allowing Seán to simply fist the ball into the back of the net to give Rathnew a 1-02 to 0-03 lead. Rathnew put two balls wide, forcing Éire Óg into a change, with Daire Divine coming in for Eoghan Potts in the half-back line. That change gave Éire Óg rearguard a bit more solidity, allowing them to build and kick-off a scoring spree that Rathnew could not cope with. Shaun Cranley drew his side level with a pair of fine frees from the 45-metre line. Cranley then set-up Fintan O’Shea to kick a high ball over the bar. Brian Lawless brilliantly denied Dan Clarke a goal-scoring chance for Rathnew as Éire Óg went into the break with a slender one-point lead at 0-06 to 1-02. If the first-half was tight and cagey, the second-half was anything but, as Éire Óg pummelled a hapless Rathnew side to claim the U20 crown. Cranley kicked off proceedings with a free inside 34 minutes, before the tremendous Conor Browne made a great save down to his right-hand side to deny Luke Corcoran a goal. That was as close as Rathnew got for the majority of the second-half, as the likes of Divine, captain Eoghan McTague, and the outstanding Brian Lawless kept the Villagemen at bay despite the physical prowess of Seán Coffey at full-forward. Both teams traded wides once again, before Cranley put Éire Óg into a three point lead with another free after Fintan O’Shea — who dominated proceedings in the middle of the park all day alongside Conal Deeney — was fouled. On 48 minutes, Cranley notched another free, before Deeney expanded that lead to five. Fionn O’Carroll played a give-and-go with substitute Seán Mason before pointing to make it six, before a further two Éire Óg wides were followed by two more Cranley frees as the game went into injury-time with the championship all-but confirmed for Éire Óg at 0-13 to 1-02. Finally, two minutes into additional-time — 38 minutes after getting their last score through the Seán Coffey goal in the first-half — Rathnew got past the disciplined and stubborn Éire Óg rearguard, ironically through a Seán Coffey point. Ciarán split the posts with a free to make it a six point game but it was too little too late. Shaun Cranley notched another free as Éire Óg made history by becoming Under-20 Football ‘B’ Champions. WicklowNews Player of the Match: Shaun Cranley. Éire Óg: C. Browne; C. Nolan, B. Lawless, A. Clarke; L. Prendergast, E. McTague (c), E. Potts; C. Deeney (0-02), F. O’Shea (0-03); R. Lucy, F. O’Carroll (0-01), D. Clarke; C. O’Flaherty, E. O’Lonaigh, S. Cranley (0-08f). Replacements: D. Divine (for E. Potts), C. Fulham (for D. Clarke), S. Mason (for C. O’Flaherty), E. O’Neill (for E. O’Lonaigh, G. O’Shea (for F. O’Carroll). Rathnew: P. Reynolds; F. O’Sullivan, J. Healy, C. O’Brien; T. O’Toole, JT Moorehouse, N. Kearney; C. Coffey (0-02f), G. Hughes; J. Cox, S. O’Dowd, L. Corcoran; D. Smyth (0-01f), S. Coffey (1-01), M. Doyle.